where LAI is the leaf area index, and K is the extinction coefficient. K is dependent on two additional variables: the leaf angle distribution parameter (X) and the viewing angle (θ) of the IRR (relative to nadir view = 0°), which is chosen by the user. These variables will be described briefly below. For more help planning the viewing angle of your IRR, click here. Leaf Area Index (LAI): area of leaves per unit area of ground [m2 m-2], which can be expressed as total leaf area or one-sided leaf area. One-sided leaf area (projected area) is half of the total leaf area and is often called hemi-surface area. LAI is typically reported as hemi-surface area per unit ground area, unless the canopy is largely made up of needle-leaf species. In cases where LAI is not directly measured, it is often approximated from canopy height. A few examples from scientific literature are given in the table below. where X is the leaf angle distribution parameter, and θ is the IRR viewing angle . Leaf Angle Distribution Parameter (X): ratio of average projected area of canopy elements on a horizontal surface to projected area on a vertical surface. X defines the distribution of leaf inclination angles in a plant canopy from 0 (horizontal) to 90 degrees (vertical). For plant canopies with more horizontally-oriented leaves, X is greater than one, and for plant canopies with more vertically-oriented leaves, X is less than one. X = 1 is a good approximation for many plant canopies because leaf area is distributed fairly uniformly among all leaf inclination angles. The figure below shows the inclination angle density for three canopies . The larger X, the more horizontal the leaves are. The equation for these distributions is given by Campbell . Additionally, X values for various crops have been estimated as shown in the table below . A simple widget recently created in the IRR product section of the Apogee website can help make the necessary calculations to estimate the fraction of canopy viewed by an IRR. For more information, click here. If you have any questions or comments, feel free to respond to this blog post below. Campbell, G.S. 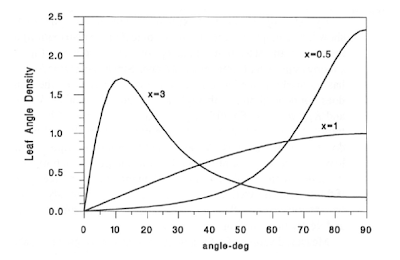 (1986) Extinction coefficients for radiation in plant canopies calculated using an ellipsoidal inclination angle distribution. Agricultural and Forest Meteorology 36:317-321. Allen, R.G., et al. (2001) The ASCE Standardized Reference Evapotranspiration Equation. Pg B-6. http://www.kimberly.uidaho.edu/water/asceewri/appendix.pdf. M.C. Anderson, et al. (2004) Upscaling ground observations of vegetation water content, canopy height, and leaf area index during SMEX02 using aircraft and Landsat imagery. Remote Sensing of Environment 92:447-464. Campbell, G.S. and Norman, J.M. (1998) An Introduction to Environmental Biophysics, 2nd ed. pg 250-253. 5] Campbell, G.S. (1990) Derivation of an angle density function for canopies with ellipsoidal leaf angle distributions. Agricultural and Forest Meteorology 49:173-176.